We've all been there. Whether it was baseball, soccer, dance team, cheerleading, volleyball, ballet, we've all had to leave behind a activity of youth that we loved - whether we did it in high school, college, or professionally. Yes, it was difficult. We had nightmares missing it. But we knew we needed to move into the next phase of our life, so we swallowed deeply and put down our pom-poms, our rackets, our gloves. Unfortunately, Brett hasn't been able to find that kind of grace. Here in July, as football fever heats up, he has been seized by panic: I must play. Never mind that fact that he's jerked the Packers and Aaron Rogers around for years. Now he's demanding to be released, so he can play for a rival team like the Vikings, and he's surprised that the Packers' front office doesn't like that idea. Really? Come on, Brett, really? There's something so deeply pathetic in this story. A middle-aged man unable to acknowledge that his best football days are behind him. A man unable to find the courage to look forward into the future and imagine a new path - perhaps as a commentator or a businessman or a philanthropist or a coach. Instead, he clings frantically to his past trying to stop the one thing in life that is inevitable: change. A part of me also suspects that Favre and his agent may have planned this to force a release from the Packers. If this is true, Favre is not only pathetic, he is despicable. Trading on his favorable image with the public to force the Packers' administration to do something they should not have to do - namely, hand their star quarterback to a competitor. Hopefully, Favre wouldn't take part in something this low. But I and others have our doubts. What Favre fails to see in his panic to be on a training field in August as he has been for almost every year of his life is that he is only delaying the inevitable. He will have to retire from NFL football. Younger players will out throw and out run him. He will have to step aside for the youth. We all have or we all will. This continual comeback only works against his legacy as he damages his relationships with others in the league, alienates his fan base, and risks looking ridiculous instead of stepping aside with class and dignity. I, for one, wish I could have slept through this embarrassing debacle - and missed the whole ugly thing. 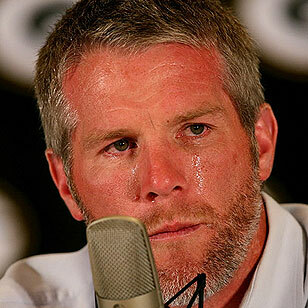 What's even worse is one day Favre will look back on all this and wish the same.